Satellite image of the Florida Keys identifying places mentioned in the text. Source: Google Earth. A string of pearls in a turquoise sea: as well as being picturesque, the unique Florida Keys offer the petroleum geologist a masterclass on carbonate sedimentary processes. Made up of over 800 islands, none more than 5.5m above sea level, and stretching in a gentle arc nearly 200 km from Miami south-westwards into the Gulf of Mexico, the Florida Keys are known for their distinctive ecology, clear waters and beautiful coral reefs; a famous playground for fishermen and snorkellers alike. However, this unique environment, the result of repeated episodes of flooding and exposure during the Pleistocene, also allows us an insight into limestone formation throughout the world. The relatively young Florida Keys have much older foundations. Precambrian-Cambrian igneous rocks were overlain by Ordovician-Devonian sediments and Triassic-Jurassic volcanics, deposited as the Florida basement separated from the African plate to join North America. Subsidence of the passive continental margin resulted in carbonate deposition about 160 million years ago in the late Jurassic, which continued through the Cretaceous and Tertiary to create the Florida Platform, an accumulation of nearly 5,000m of shallow-water carbonates and evaporites with only minor components of terrigenous sediments. Sketch cross-section roughly north-west to south-east across the Florida Keys. Modified from Shinn and Lidz, 2018. Carbonate sedimentation continued through the Pleistocene and Holocene and on into the present, interspersed by glacial and interglacial periods and subsequent marine incursions and withdrawals. It is these variations in sea level, starting 125,000 years ago when the sea level was about 7m higher than at present, which have been primarily responsible for the geology and topography of the Florida Keys. At that time the sea was warm enough to allow coral to grow and reefs and sandy bars formed on the shallow shelf. Sea levels fell during the last ice age, so that about 20,000 years ago these reefs and ridges were exposed and vegetation grew on the once-submerged areas. The glaciers gradually melted, sea levels rose again, until now only the highest points of the ridges are visible, and both fossil and modern coral reefs lie submerged to the east and south of the arc of islands. and the oolitic Miami Limestone. The former is described as an elevated coral reef rock that was submerged as sea levels rose. It consists of hermatypic corals (i.e. corals which deposit hard calcareous material to form the stony framework of the reef) with intra- and interbedded calcarenites and thin beds of quartz sand, and is thought to be up to 60m thick. The younger oolitic Miami Limestone is composed of millions of ooids, formed in clear current-swept waters supersaturated with calcium and carbonate that precipitated out around a nucleus grain to form these tiny spherical pellets. Coring has shown that the oolite is underlain by the older coralline limestone. Both these limestones have undergone alteration and diagenesis due to subaerial exposure, which has produced widespread minor karstification and in places a reddish-brown laminated calcrete crust, known as caliche. This forms when aragonitic mud and sand dissolve in damp organicrich peaty soil. As the water drains downwards, picking up oxidised iron and clay material, and the soil dries, the dissolved calcium carbonate precipitates as a thin iron-rich layer of calcite on the underlying limestone. The Keys can be divided into the long linear islands of the Upper Keys, covering the south-west trending crescent from just south of Miami to Bahia Honda Key, where the Key Largo Limestone is at the surface; and the roughly east-west trending line of larger islands of the Lower Keys, composed of the Miami Limestone. To see some of these features, let’s take a (virtual) road trip down the iconic Interstate Highway 1 from where it joins the archipelago at North Key Largo to its terminus at Key West. 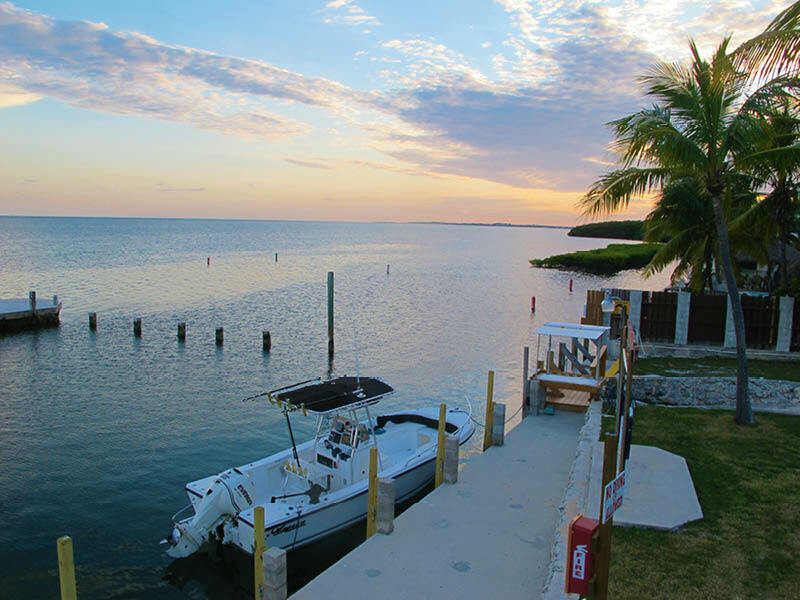 A boat and a tranquil sunset: that’s what a trip to the Florida Keys is all about. © Jane Whaley. A boat trip to the reefs and corals on the ocean side of the islands is a good way to start your tour. Running roughly parallel to the Keys offshore oceanwards are several discontinuous ridges. The outer ones are composed primarily of massive Pleistocene and Holocene coral species, while the inner ridge is a backreef marine sand belt. 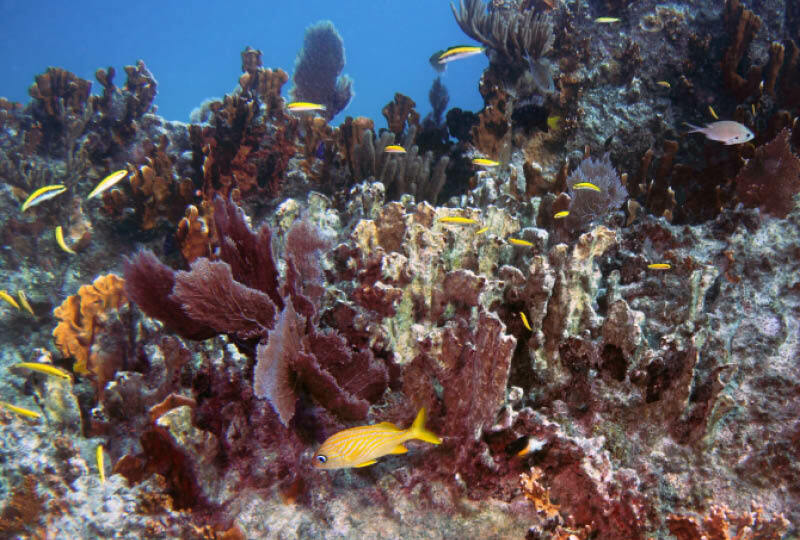 Diving or snorkelling at the popular Grecian Rocks, about 7 km off Key Largo, allows you to see that this inner ridge is composed of coral, algal and molluscan sand flats and sand waves, with some massive corals. The ridges are separated by the Hawk Channel, a calm passage of water about three kilometres wide, which extends all the way from Miami to beyond Key West. It is a limestone ledge with a covering of fine-grained sediment and probably represents a palaeo-shoreline. It is dotted with patch reefs of mainly massive corals which lie just a few metres below the water surface – so be careful where you go with that boat! Further south, Tavernier Key Bank is another good place to explore the inner ridge. While still in the Upper Keys, take a look at the ‘lakes’, mud banks and islands of Florida Bay: a famous laboratory for discovering how fine-grained limestone forms. The sticky H2S-rich mud lining the shallow (less than 4m deep) bay is composed primarily of the faecal pellets of marine organisms, mainly worms. When reef corals first started forming at the end of the Pleistocene, this area was probably a limestone platform supporting a swampy freshwater marsh, but seawater slowly flooded it and limey mud began to accumulate. Topographic highs where mangrove islands had been present are now the mud banks and low islands seen dotted around the bay. Warm shallow seas like this are responsible for thick sequences of organic-rich carbonate rock, found worldwide and so important to petroleum geology. Mangroves are vital for the environment of the Keys. © Jane Whaley. 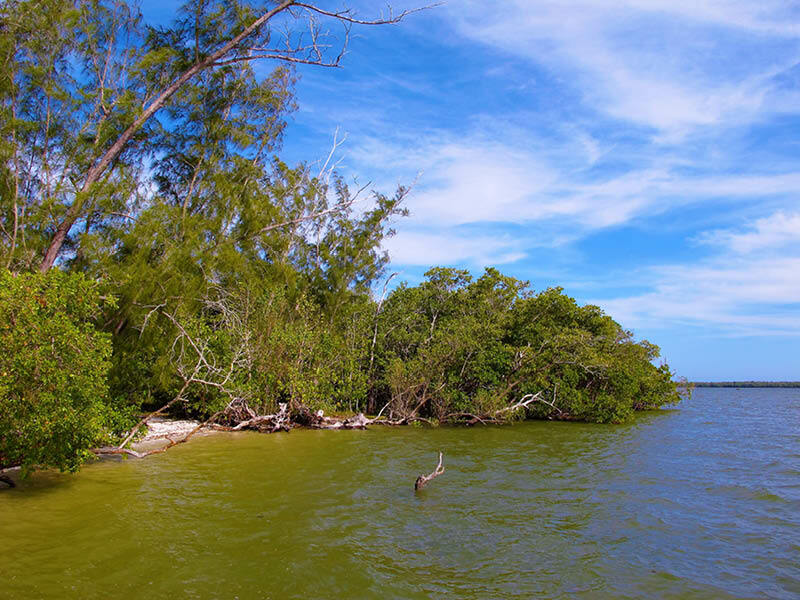 As you travel down the Keys you will note the transition zone along the coasts, moving from low energy shallow water to a complex of mangrove swamps and other salt-tolerant plants. Mangroves are very important to the ecology of the region, as they trap and stabilise fine sediment in their complex root systems, provide substrate for carbonate secreting organisms, shelter a wide range of vertebrate and invertebrate organisms and protect the coastline from waves, storms and hurricanes. Destruction of mangroves for development removes this vital natural protection, sometimes with disastrous effects. The best place to see clean exposures of the Key Largo Limestone is the disused Windley Bay Quarry near Islamorada, where visitors can inspect the coralline rock in the quarry walls. The rock is a white to light grey, moderately hard limestone composed mostly of coral heads with fossil molluscs and bryozoans, encased in a matrix of sand-sized grains. Although it is usually described as a coral reef, there is evidence that not all the corals are in their original growth positions, and the depositional environment may well have been a carbonate sand bank with patches of coral. Within some of the quarry walls there are layers of red soils, known as terra rossa. Over thousands of years, naturally acidic rain water dissolved some of the limestone, leaving behind a residue consisting mainly of African dust that had blown across the Atlantic Ocean and been deposited along with the carbonate sediments. The phenomenon of African dust storms in the Caribbean continues to this day. Sunset at Key West. © Jane Whaley. After crossing Seven Mile Bridge (one of the longest bridges in the world when it was built over 100 years ago), you come to Bahia Honda Island, site of one of the only really good sandy beaches in the Keys (closed at the time of writing due to hurricane damage), where you can study Holocene aeolian dunes, beach ridges, and modern carbonate systems. From this point the line of islands gradually starts to trend east-west: we have arrived in the Lower Keys. No longer elongate along the arc, the islands are larger and sculpted by north-south trending channels into sand bars. This reflects the fact that Big Pine Key, just to the west of Bahia Honda, marks the transition between the Key Largo coral and the Miami Oolite; the southern tip of the island is the most westerly outcrop of the older formation. About 25 km before you reach Key West is Sugarloaf Key, an area where dolomitisation can be observed occurring, a discovery which has helped petroleum geologists recognise analogous supratidal environments in ancient carbonate rocks. Dolomitisation increases carbonate porosity, so understanding its diagenesis is key. Although the road ends at Key West, the reef system continues westwards a further 64 km to a shallow Pleistocene limestone platform called Halfmoon Shoal, where the sediment is thin, and sponges grow directly on the bedrock. Beyond this is a 30-km wide swathe of Holocene limey mud, known as the Quicksands, where mega-ripples move with the tides, possibly a cause of a number of shipwrecks in the area. It is possible to take a boat right out to the Dry Tortugas, although there is debate as to whether this atoll is actually part of the Keys’ reefal system. 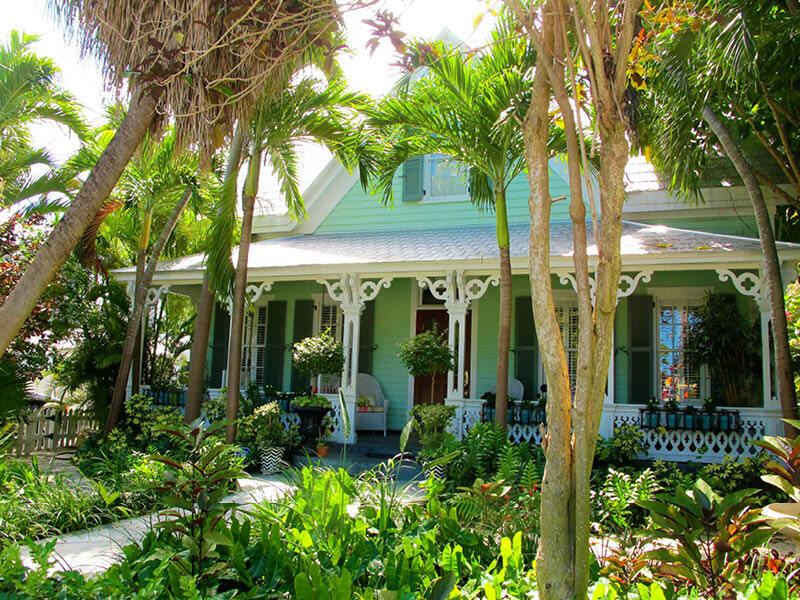 One of the many beautiful colonial cottages in Key West’s historic Old Town. © Jane Whaley. 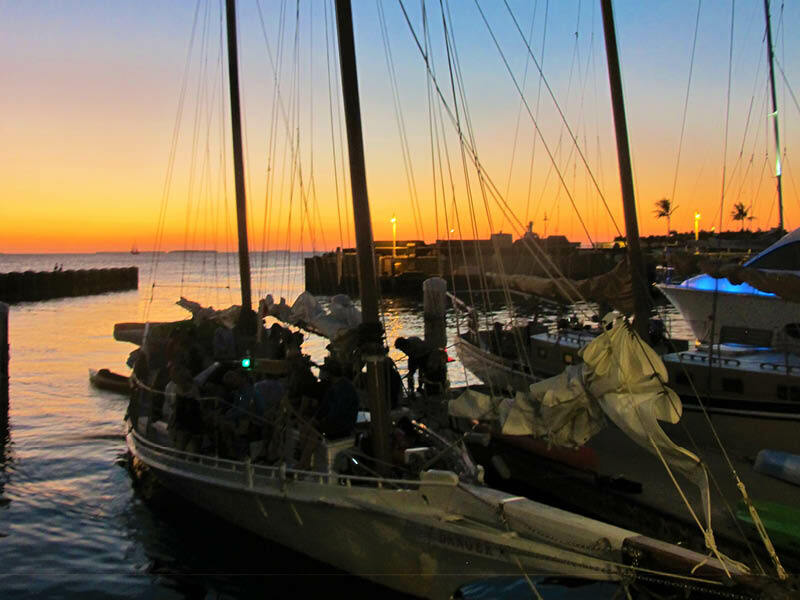 The town of Key West, which has 32% of the entire population of the Keys, is now the epitome of ‘laid back’, but it has a much tougher history. After Florida was ceded by Spain to the United States in 1821, Key West became an important military outpost guarding the entrance to the Gulf of Mexico. It grew into a trading centre, but many of the island’s inhabitants supplemented their trading and fishing income by recovering goods from shipwrecks – some of which they may have actually caused – and it became famous for rum, drug and people smuggling. By 1889, Key West was the largest and wealthiest city in Florida, and the beautiful Victorian wooden mansions of what is now ‘Old Town’ bear witness to that wealth. Coral and fish at Molasses Key, near Seven Mile Bridge. Source: Joseph Quinn/www.123rf.com. The Florida Keys has a unique ecosystem with many species, on land and at sea, that are found nowhere else. These include the Lower Keys marsh rabbit, the Key Largo cotton mouse, the tiny Key deer, the Key ring-neck snake and the Stock Island tree snail, among many others. The Florida Keys National Marine Sanctuary is home to over 6,000 species and Florida Bay hosts a variety of birds, as well as sharks, dolphins, and manatees. But this is a fragile and ephemeral environment, and many of these species are endangered as their equally unique habitats have been encroached upon through development for tourists, retirees, hunters, fishermen and divers, as well as natural disturbances like hurricanes. Nothing shows this as clearly as the coral reef, which has been in decline since at least the 1970s. Sewerage, pesticides, small boat pollution, and even an excessive use of oily sunscreens and the like have all contributed. The most serious danger comes from the gradual increase in sea water temperature and acidification and a continuing rise in sea levels, which could return these islands to the submerged condition in which they originally began to form, 125,000 years ago. Halley, R.B., Vacher, H.L. and Shinn, E.A., in Geology and Hydrology of Carbonate Islands. Developments in Sedimentology 54, edited by H. L. Vacher and T. Quinn ©1997 Elsevier Science B.V.
Hoffmeister, J.E. and Multer, H.G., 1968. 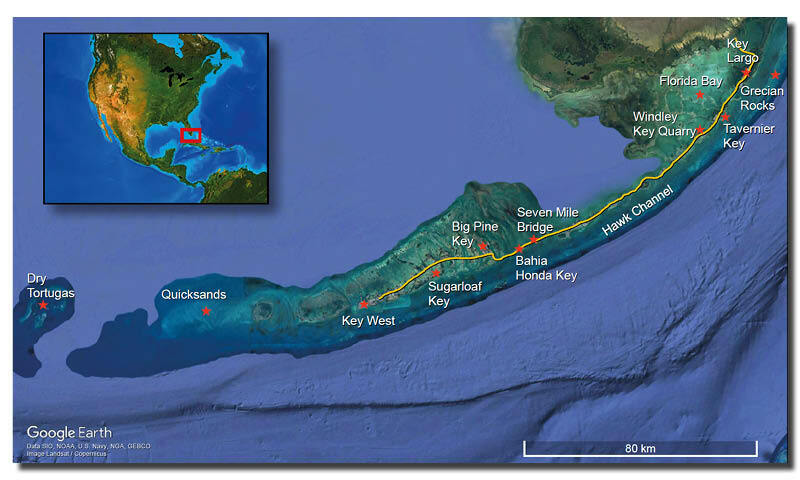 Geology and origin of the Florida Keys. Geol. Soc. Am. Bull., 79: 1487-1502. Some recommended GEO ExPro reading relating to, or similar in content to, carbonate petroleum geology. The 2006 discovery at Tupi, offshore Brazil, opened up a new chapter for petroleum reservoirs: lacustrine carbonates capable of producing hydrocarbons at extremely high rates. Situated adjacent to the very prolific Permian Basin is one of the earth’s greatest and most studied carbonate depositional systems, the Permian Reef Complex of New Mexico and west Texas. “Land’s End”: is there a more evocative place name in the world? A visit to England’s furthest south-west corner reveals a land of extremes, with a wildly beautiful coast, picturesque coves, bleak granite moorlands, and some unusual and fascinating rocks.